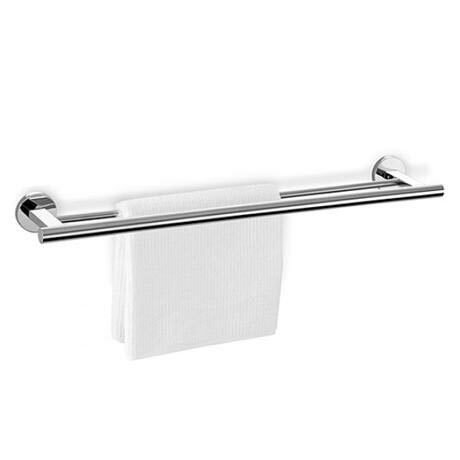 A modern wall mounted designer double towel rail from Zack's exclusive Scala stainless steel collection. Zack's practical on-trend bathroom accessories are made from quality 18/10 stainless steel with an outstanding glossy finish, supplied with wall mounting, concealed fittings. The minimalist soft rounded forms of this sleek double towel rail would fit in harmoniously into a wide variety of bathrooms. Give your bathroom that spa like effect, with a wall mounted double towel rail from Zack, to keep up with the current trends of 2013. It is made from a strong and durable stainless steel and finished in a high gloss to give it a stylish look. It features two rails meaning you can fit multiple on it at any one time. It is wall mounted making it a great space saver as it will leave the floor free of any loose towels or clothes and doesn’t stick out from the wall meaning you can make the most of the space you have.